Competition has evolved with our fleet of sports interactive inflatables. Challenge your friends with our Zorb Ball Set with Track inflatable. 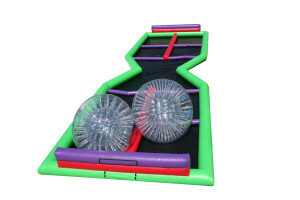 Two competitors enter two Zorb balls and race over the crossover track to determine who the true champion is.